Polylactic acid (PLA) is only biodegradable in industrial settings. Recovery of bioplastics like PLA in recycling facilities is not easy due to low volumes and often optical similarity with traditional polymers. California based BioCor LLC created an optical sorting machine able to detect and sort PLA from PET (polyethylene terephthalate) or HDPE (high density polyethylene) at high speeds. This device can be installed by high volume recycling facilities to collect the valuable bioplastic. The Company intends to buy all post industrial and post consumer products made of PLA such as water bottles, juice bottles, clamshells, cups, cutlery and several other products. Unlike most petroleum-based plastics today, PLA offers a true “cradle-to-cradle” benefit whereby PLA can be completely converted back into its fundamental building block, lactic acid. To date, BioCor LLC in cooperation with Plarco Inc. converted over 20 million pounds of post industrial PLA back to its lactic acid feedstock. Plarco is located at the facility used by WRR Environmental Services Co. Inc. and EnviroGreen in Eau Claire. Previously, EnviroGreen had been converting PLA back into lactic acid for PLA manufacturer NatureWorks LLC. NatureWorks is a minority stakeholder in Biocor and also has agreed to purchase all the lactic acid made by Plarco and subsequently, produce PLA resin. 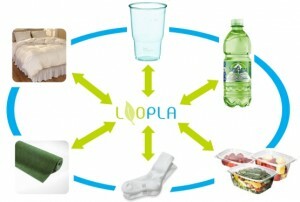 The Belgian Galactic, one of the world’s biggest PLA producers, developed the LOOPLA concept to provide an end-of-life option for PLA wastes. Also LOOPLA offers the possibility of directly going back to the original monomer lactic acid by PLA hydrolysis. “The process for post consumer wastes is the most complex. It involves collecting and separating PLA from PET, often mixed together. It is crucial to sort out PLA from PET to avoid affecting the recycling of PET (yield and quality) and also recovering a single stream on PLA in order to recycle it. There are technical solutions including NIR (near-infrared) installations able to effectively separate PLA and PET from a mixed waste. Unfortunately, it has not been reported whether this sorting method is already installed, or if the LOOPLA concept depends still on the end users awareness of the importance of sorting his waste, to recover PLA.